World-class Canadian resorts combined with breathtaking scenery highlight this Canadian Rockies tour—with overnights in Calgary, Lake Louise, Jasper, Banff, Kamloops, and Vancouver. In Lake Louise, stay at the elegant Fairmont Chateau Lake Louise, known for its breathtaking setting, comfort, and Old World charm. Here, Globus has arranged a special experience for you—a leisurely guided walk along the gorgeous lake to hear about its history. In Jasper National Park, stay two nights at the Fairmont Jasper Park Lodge, set deep in the Canadian Rockies and the embodiment of peace, tranquility, and natural beauty. Cruise on Maligne Lake and enjoy leisure time in Jasper, strolling through the pretty streets or relaxing at the lodge with its fun opportunities. Take in the natural beauty of Banff and Yoho National Parks, and spend two nights at the famous Fairmont Banff Springs Hotel, a symbol of the Canadian Rockies with its championship golf course, world-class spa, and luxurious comfort in a pristine wilderness. In Banff, Globus has arranged another special experience for you… meet a Canadian Mountie and learn about their important role in Canada’s history. With photo opportunities, of course! A highlight of this Canadian Rockies tour is a journey on Icefields Parkway to savor stunning views of alpine meadows, waterfalls, and glacier masses followed by a thrilling ride aboard an Ice Explorer on the Columbia Icefield, the largest expanse of ice in the Canadian Rockies. Another highlight is your journey on the Rocky Mountaineer train from Banff to Vancouver. From your dome coach with panoramic views and oversized windows, see wild rivers, majestic mountain ranges, and beautiful lakes. Throughout this tour, you’ll witness stunning scenery and enjoy the serenity that only these majestic lodges and settings can offer. It’s a dream vacation! Day 4: JASPER. EXCURSION TO MALIGNE LAKE. 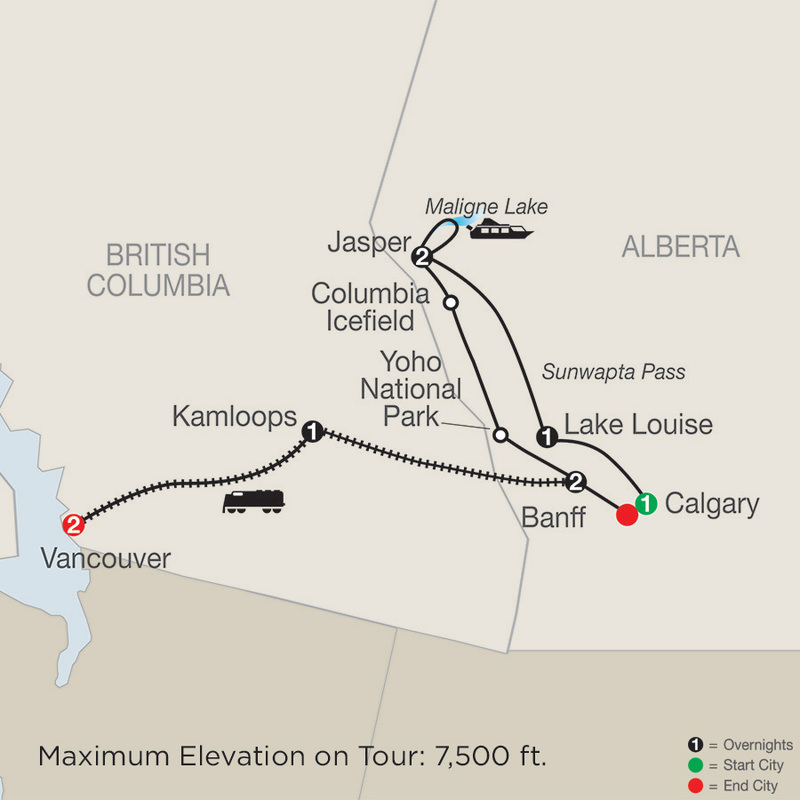 Day 5: JASPER–COLUMBIA ICEFIELD–YOHO NATIONAL PARK–BANFF. Rocky MountaineerFree Wi-Fi available on your motorcoach. Known as the "Castle in the City," Fairmont Hotel Vancouver reflects timeless luxury and history of Vancouver. Holding a prime downtown location, the hotel is minutes away from some of Vancouver's biggest attractions including Granville Island, Robson Street shopping, Gastown, and Canada Place.